We’ve designed the perfect day for you and your family. Being mayor of Jackson is just one of Pete Muldoon’s three jobs. Explore one of the country’s most vibrant art communities. Crowned the first-ever Chopped Junior Grand Champion, an interview with Buck Milligan. Our take on the valley’s newest restaurants. Ski equipment—from poles to lift chairs—can live on after it retires from the slopes. 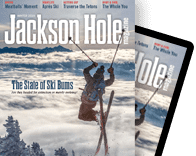 As a young boy, Jim Kercher had two ongoing experiences that shaped the man he became: skiing and international living. Stio seeks to design outerwear inspired by the valley’s unique lifestyle. The result? Technical clothing that looks as good as it performs.